The Republic Day Parade in Delhi is the highlight of Republic Day in India. There are a couple of ways to get tickets to the parade. Front row passes can be obtained from senior government officials and VIPs in Delhi, if you happen to know any. Otherwise, you'll have to buy your tickets. Tickets for India's Republic Day Parade are on sale from January 7 to January 25 every year, at Departmental Sales Counters in the following locations. The ticket counters are open daily from 10 a.m. to 12.30 p.m. and 2 p.m. to 4.30 p.m. In addition, one ticket counter at Sena Bhavan will remain open until 7 p.m. from January 23 to 25, 2019. However, do note that all ticket counters will be closed in the morning on January 23, due to full dress rehearsal of the Republic Day Parade. The Republic Day Parade is followed by a Beating Retreat ceremony at Vijay Chowk on Rajpath, in the afternoon of January 29 each year. It symbolizes retreat after a day on the battlefield and features performances by bands of the three wings of the Indian military -- the Army, Navy and Air Force. Tickets are available for the full dress rehearsal of this event at the above outlets up until 3 p.m. on January 28, 2019 (closed Republic Day). Republic Day Parade -- 500 rupees for reserved seats. 100 rupees and 20 rupees for unreserved seats. Reserved seats are located closer to the main stage where all the action takes place. Unreserved seating is provided on a first-come basis. If you have unreserved tickets, make sure you arrive at the venue early to get the best position. Beating Retreat Ceremony (Full Dress Rehearsal on January 28) -- 50 rupees and 20 rupees. All seats are unreserved. 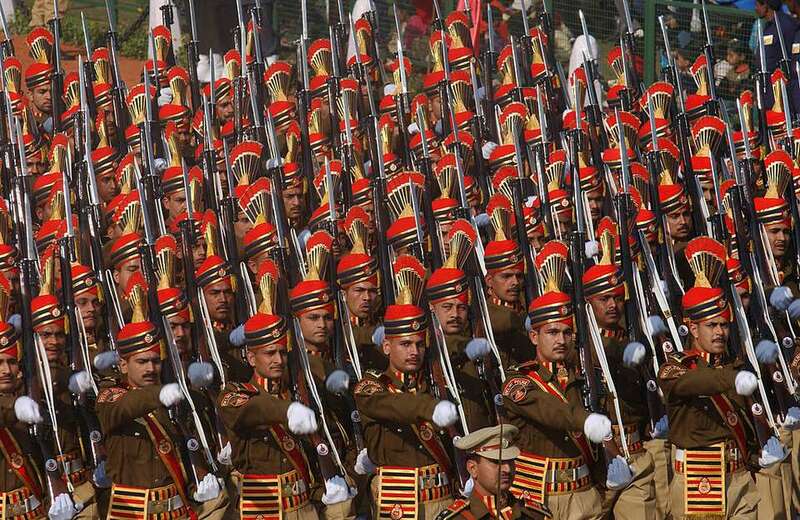 Unfortunately, getting tickets for the Republic Day Parade can be a very frustrating experience. Do be aware that only a certain number of tickets are allocated for sale at each ticket counter per day. Sometimes, the ticket counters don't receive the tickets until the afternoon. Furthermore, there are restrictions on the number of tickets that may be purchased by each person. Demand for 500 rupee reserved seating tickets is high and the supply is very limited. Only one such ticket can be purchased per ID card. However, they still sell out very quickly after the ticket counters open at 10 a.m. If you want one of these tickets, it's recommended that you line up as early as 8 a.m. The 100 rupee tickets have a decent enough view and are a bit easier to obtain, although only two tickets can be purchased per ID card. The 20 rupee tickets are usually readily available. Phone Mr Rajeev Kumar Kundi, Officer on Special Duty (Sale of Tickets & Printing), on (011) 2301-0047.